Frances Hardinge, A Face Like Glass. Amulet Books, 2017. Pp 487. ISBN.978-1-4197-2484-8. $19.95. 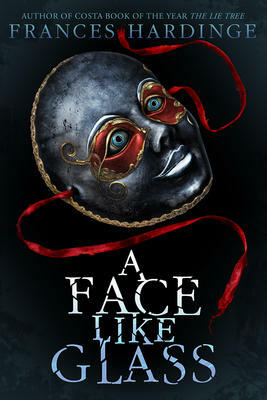 Frances Hardinge’s A Face Like Glass first appeared in the UK in 2012 and has only just arrived in the US this spring. It straddles the gap between children’s literature and the young adult genre uneasily; the protagonist is a preteen girl named Neverfell, who is too young to be interested in the romance or nascent sexuality that is usually a hallmark of YA, and yet she is witness to the aftermath of numerous murders, and the threat of violence is often just off-page. And yet Hardinge loves playing with language in a way that recalls some of (what I think, anyway) is the finest children’s lit like The Phantom Tollbooth, The Neverending Story, or Alice in Wonderland—the latter of which the author has a small homage to when Neverfell follows a rabbit up rather than down, discovering a wider and scarier world in the process. Neverfell lives in Caverna, an underground world whose extensive caste-based society ranges from lowly Drudges to the highest members of Court. The central focus on Faces, or the ability make facial expressions, an art form which must be extensively practiced and which is limited by caste, with Drudges limited to only a small number (and none of them ever angry or dissatisfied) and members of Court with access to hundreds. Neverfell, as a girl from the world above, has ready access to numerous faces naturally, all of which ripple across her face and betray immediately whatever she really thinks. When she is discovered as a child by the Cheesemaker Grandible, he is horrified by this and has a mask made for her, convincing her that she must be astonishingly ugly. When a Master Facesmith visits the Cheesemaker, Neverfell hopes that she will help her make a Face of her own… and from there follows Neverfell’s adventures and misadventures in and out of Court, numerous mysteries around both Neverfell’s unknown origins and a series of murders, and finally, something like a revolution at the end. A Face Like Glass is incredibly complex and sprawling as Neverfell climbs up and falls down the social ladder on several occasions. Unfortunately, Neverfell is both incredibly naive—which means that the other characters have to repeatedly explain what’s “really” going on to her, each situation’s dangers and benefits, and so on—and strangely without her own agency. She gets adopted by Grandible in the beginning; she is adopted literally or metaphorically throughout the rest of the book by other families, friends, and enemies for their own purposes, and so plot keeps happening with Neverfell usually a bystander. When she does take control in the final pages of the book, it is just before she takes an amnesia-inducing potion, so she only gets to see the effects of the successful plan, and so is rendered passive even by herself. I had mixed feelings about this book—though I suspect they have more to do with an adult reading a children’s book than anything else. The plot is incredibly unhurried in a way that will likely work for a young reader who is reading slowly and with absorption, the better to enjoy the minutiae of description and detail that permeate the text. Unfortunately, I rather wished the characters would just get on with it, rather than telling one another their plans, explaining how the plans would work, then carrying out the plans, etc. The sprawling length of the story also meant that minor characters would be introduced briefly and only reappear a hundred or more pages later, by which time I had forgotten who they were and what they were meant to be doing; I wish a Dramatis Personae could have been provided, as it would have been helpful. On the other hand, I immensely respect the amount of thought that Hardinge put into her world, especially with its use of language and some truly memorable turns of phrase. As a side-effect of living underground, the time of day is delineated through counted hours; to be “out of clock” is to not match the schedule of hours, while to always be “on clock” is to maintain an unusually steady sleep and activity period. Other inventive elements include the True Crafts, in which True Wine, True Cheese, and so on, have properties beyond taste and smell, including the abilities to alter memories or provide hallucinogenic sensory experiences, among others. I think young readers will get the most out of this book, but adults with sensitive children may want to peruse the volume first because of the violent scenes—which are admittedly far and few between—haunt the characters throughout. Adults will enjoy a well-told and absorbing adventure story, one without the seemingly omnipresent love triangles that have become cliche to so much of the YA genre. Neverfell is, if not altogether endearing, at least far from a cliche.